Would you like to swim more often and extend your swimming season? Well you can do just that. Whether it's an Above ground, In-ground pool or portable Spa there is a Dome or Enclosure to suit your taste and your budget. Each year more and more of our customers look for cost effective solutions which will allow them to use their pools more often. Why not check out our amazing range of IPC Enclosures which we can fully recommend for the quality and appearance of the product, backed up by professional and hassle free installation. 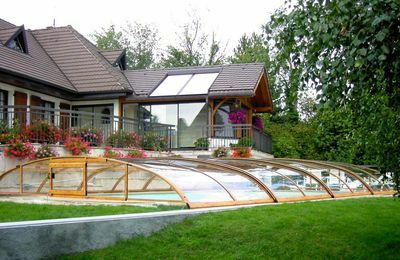 Fabrico Sun Dome - With an aluminium pole frame that attaches to the top cap of the pool, they are very easy to install. The Clear vinyl Cover pulls over the frame and is tightened by hooks attached to the uprights. With zip door and window sections you can enjoy swimming even when the weather is poor. Plastica Air Dome - The same Dome as for the above ground pool. Entry is gained by two zipper type doors. IPC Enclosures - A huge choice of designs available, high or low , large or small. The rail system secures the enclosure to the ground but also allows for sections to be easily slid back for open air swimming. With the exceptional choice of enclosures on offer you may be wondering which would best suit your pool or spa, your home environment and your family? Am I looking for a low, medium or high level enclosure? What will that enclosure look like over my pool? We can help you make your decision with confidence. Give us a call on 08451 303067 for more details and to get a quotation. PLEASE NOTE : PRICES ARE NOT SHOWN FOR IPC ENCLOSURES ON THE WEBSITE - THEY ARE ALL SUBJECT TO INDIVIDUAL QUOTATION. Sunhouse, Orlando Sun Domes & Veranda Spa Enclosure - Keep the weather out and the relaxation in. Spa enclosures that fully protect against wind, rain, leaves and debris.